NetEnt is one if not the most prominent name in the industry. It is an award-winning software company which has manufactured hundreds of gaming products. Their games can be virtually found at any modern, reputable and fully licensed online casino operating in the industry. The company is best known for producing top-notch, state of art video slots which cover a wide range of themes. One of the most popular video slots released by NetEnt is their Dead or Alive game which takes players on a remarkable virtual journey. The game was released in 2009 and soon later it has gained some kind of legendary status which did not change to this day. Following the amazing popularity of Dead or Alive, the game’s developer decided to introduce Dead or Alive 2 slot which is unarguably wilder and bigger. It should be noted that the Dead or Alive 2 slot is a completely different game from the original title, but the games still share some common features. The sequel also includes 5 reels and 9 paylines and they share the same theme which depicts an old Wild West town. The main action in the game actually takes place in the town's main street with sunset beams neatly depicted in the backdrop as well. The ultimate show begins when players enter the saloon by triggering the game’s bonus mode. In terms of its looks, the game definitely impresses. While the game features some retro visuals, it is rendered with top-notch, high-definition graphics. The game’s symbols which appear across the reels actually pay tribute to the game’s original, but they are rendered in more modern, updated artwork. When it comes to the game’s bonuses, players will not be disappointed either. In addition to featuring standard symbols depicting boots, whiskey bottles, cowboy hats and other symbols related to the theme, the game also features wilds and scatters. Wilds, as expected, replace regular symbols on the reels. Like the original game, Dead or Alive 2 slotalso comes with a great scatter win jackpot players can win by landing five scatters in the base game. There is also a free spins mode featured in the game players trigger by landing three or more scatters on the same spin. There are actually three different bonus modes including the Train Heist, Old Saloon and High Noon. 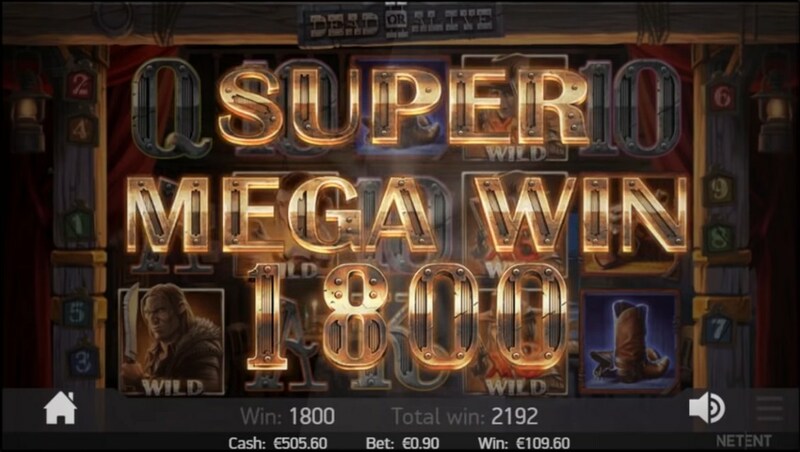 Each of these games with generous winning multipliers offering players the amazing opportunity to score winnings worth over 100.000x their stake.